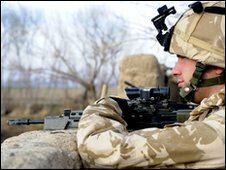 The first stage of a major Nato offensive in southern Afghanistan involving 1,000 UK troops has gone to plan, the Ministry of Defence has said. British soldiers are among 15,000 Nato troops searching for the Taliban in Marjah and Nad Ali in Helmand province. Maj Gen Gordon Messenger said British troops, working with Afghan forces, had come under small-arms fire but "nothing had stopped the mission progressing". Meanwhile, a UK soldier killed on day one of the operation has been named. L/Sgt David Greenhalgh, of 1st Battalion Grenadier Guards, died in an explosion while on vehicle patrol near Lashkar Gah on Saturday. 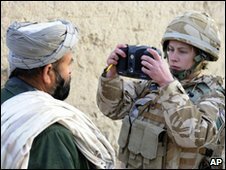 Another British soldier, who has not yet been named, was killed on Sunday in an explosion to the north-east of Sangin. His death was unconnected with Operation Moshtarak. On day two of the operation, Nato said 12 civilians were killed after two rockets missed their intended target in Marjah. Nato's commander Gen Stanley McChrystal said he "deeply regretted this tragic loss of life". President Hamid Karzai has called for an investigation into the deaths. The MoD said there had not been any civilian deaths in the British-controlled area. It also said there had been less "tics" - which stands for "troops in contact", essentially fire fights - than in an average day in Helmand. At an MoD briefing in London, Maj Gen Messenger - chief of the defence staff's strategic communications - said no artillery had been fired and no bombs dropped in the area where British efforts were focused. An Apache helicopter had fired a Hellfire missile at insurgents after members of a patrol were attacked from a distance, he said. He said soldiers from the Royal Welsh Regiment, working with Afghan forces, had uncovered 13 improvised explosive devices and military tunnels. But Maj Gen Messenger said the past 48 hours had been the "easy bit". "The challenge is to provide security that allows the Afghans to provide for their people. The success of this operation will be judged on that," he said. The Taliban, although "divided and fractured", remained an "adaptable foe", he added. He said work had already begun to build bridges over canals and create temporary bases in the area. Programmes allowing local people to start building up the infrastructure could begin on Monday, he said. Earlier, Defence Secretary Bob Ainsworth said the biggest threat facing troops taking part in the operation was roadside bombs. He told Sky News: "We have lost more people to roadside bombs than anything else in the last few years." Mr Ainsworth also told the BBC the international community would have to provide financial assistance to Afghanistan for "some considerable time" afterwards. We have little choice. We pull out, Pakistan falls. This is the era of the new domino theory. The big test would be whether Nato forces could "win over hearts and minds". The BBC's Ian Pannell, who is embedded with British forces, said there had been far less resistance than expected, but insurgents continued to remain in the area. But, at the same time, the soldiers were working to convince locals that they planned to stay in the region. The BBC's security correspondent Frank Gardner, in Kandahar, said troops were "braced for further casualties" from "thousands" of booby traps in the area. "Compound by compound, building by building, they are having to search - often doorways to shops, bazaars, are rigged with these IEDs," he said. Operation Moshtarak - which means "together" in the local Dari language - is the biggest Afghan mission since the 2001 invasion. It is being led by 4,000 US Marines, supported by the Afghan National Army and British, Canadian, Danish and Estonian troops. More than 1,200 British troops are currently involved on the ground, with a further 3,000 available if needed. Soldiers from the Grenadier Guards Battle Group, Coldstream Guards and the Royal Welsh are taking part, along with the Helmand Provincial Reconstruction Team and the Operational Mentor and Liaison Team. Prime Minister Gordon Brown said on Saturday the aim of the mission was to break, divide and split the Taliban. He said he was "proud of the exceptional role that British forces have played" in the operation. Foreign Secretary David Miliband said this was a "decisive year" for the Afghanistan campaign, but it was "too premature" to talk about the withdrawal of British troops. L/Sgt Greenhalgh was one of three International Security Assistance Force (Isaf) troops who died in southern Afghanistan during the first day of the operation. The 25-year old soldier, from Ilkeston, Derbyshire, died as he was securing a safe passage for others to pass through. His commanding officer, Lt Col Roly Walker, said L/Sgt Greenhalgh was "watching over others so they could move safe from harm" and had paid the "ultimate sacrifice" for a "noble purpose". The soldier killed on Sunday was from 6 Rifles, serving as part of 3 Rifles Battle Group. He was on foot patrol when he died. Next of kin have been informed.